Mailbox Monday is on tour, with August’s location being at Amused by Books. Now for the first time in one captivating volume, here are the first three mysteries featuring J.A. Jance’s most popular and enduring character, Seattle homicide detective Jonas Piedmont Beaumont. It’s a trio of tales steeped in the atmosphere of the Pacific Northwest that is sure to remind everyone that Jance is a master of modern suspense fiction. In Until Proven Guilty, Beaumont finds himself investigating the murder of a five-year-old girl. But his own obsession and demons could prove dangerous companions in a murky world of blind faith and religious fanaticism as he discovers that he himself is the target of a twisted passion … and a love that can kill. In Injustice for All Beaumont’s well-earned vacation becomes a waking nightmare as he’s forced to comfort a beautiful blonde after she discovers a dead body on a Washington beach. Suddenly a lethal brew of lust, madness, and politics threatens to drag the dedicated Seattle cop into the path of a killer whose dark hunger is rapidly becoming an obsession. And in Trial by Fury a naked, dead body is found lying in a Dumpster. What’s most shocking is the manner in which the man died – he was lynched. The victim, a high school coach, has left behind a very pregnant wife with a very dangerous secret. And a sixth sense developed over twenty years on the job tells Beaumont that this investigation is going to the lethal extremes of passion, lies, and hatred. A rash of horrifying crimes rips through the city, throwing it into complete chaos and terrorizing everyone living there. Immediately it becomes clear that they are the work not of an amateur but of a calculating, efficient, and deadly mastermind. The city calls on Detective Michael Bennett, pulling him away from a seaside retreat with his ten adopted children, their beloved nanny, Mary Catherine, and his grandfather. Not only does it tear apart their vacation, it leaves the entire family open to attack. Bennett enlists the help of a former colleague, FBI agent Emily Parker. As his affection for Emily grows into something stronger, his relationship with Mary Catherine takes an unexpected turn. All too soon, another appalling crime leads Bennett to a shocking discovery that exposes the killer’s pattern and the earth-shattering enormity of his plan. I love James Patterson! He is my can’t fail thriller author. Enjoy! Looks like some “thrilling” reads ahead for you. Sorry, couldn’t resist. Enjoy! Enjoy your new mysteries. They look like fun! Kim – I LOVE Patterson too! A lot of people hate him and the way he churns out book after book, like an assembly line. I don’t care … he keeps me entertained and that’s all that matters. 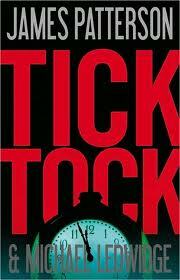 Amused – thank you, I’m excited for them, especially Tick Tock!